Our research focuses on the agricultural needs of resource-limited, small-scale farmers. We strive to contribute perspective that has not been extensively researched by others. In many instances, this involves starting with innovations (e.g., use of green manures) that have proven successful but for which there might be untested variations or modifications that could be of benefit to farmers. 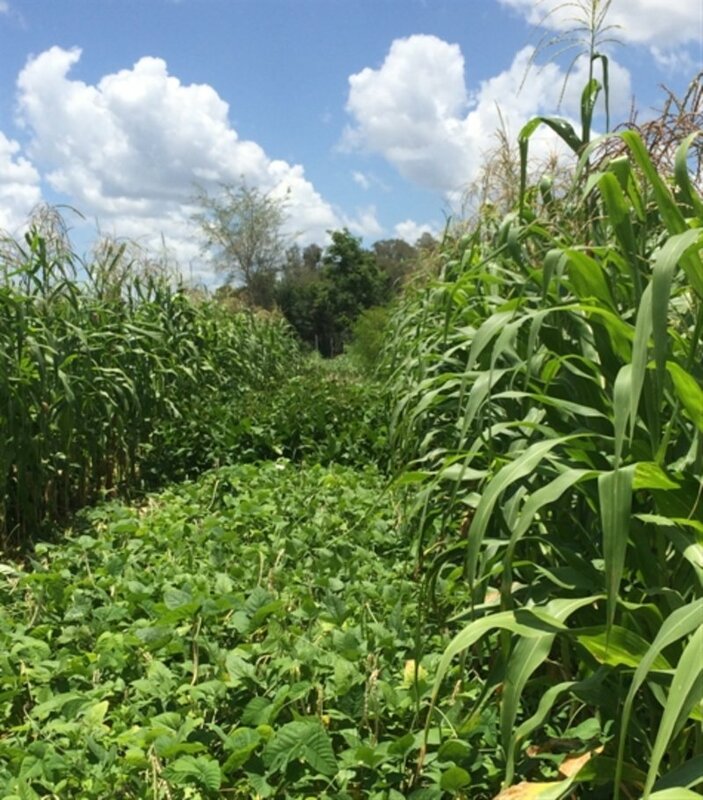 A trial at ECHO's demonstration farm in Florida, testing a “2-4-2” maize-legume intercropping system developed by the International Institute of Tropical Agriculture. In this trial, we measured grain production with the legume being either cowpea (Vigna unguiculata), jackbean (Canivalia ensiformis), or velvet bean (Mucuna pruriens). For instance, the trial pictured on this page (left) is based on a maize-legume intercropping system developed by IITA (International Institute of Tropical Agriculture) in which two rows of maize are alternated with four rows of cowpea. As explained in an online IITA publication entitled Improved cowpea-cereal cropping systems: cereal-double cowpea system for the northern Guinea savanna zone, total grain (cowpea + maize) production in large-scale farmer field trials increased from less than 1.5 t/ha with traditional practices to over 3 t/ha with the 2-4-2 approach. 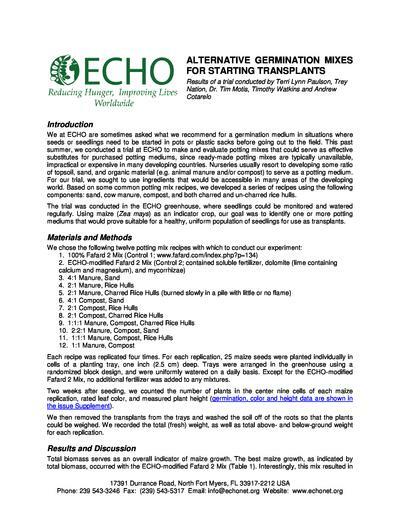 Many of the experiments we have written about in ECHO Development Notes were conducted by ECHO interns at our Global Demonstration Farm in southwest Florida. There is also research taking place at our Regional Impact Center in Asia and East Africa. 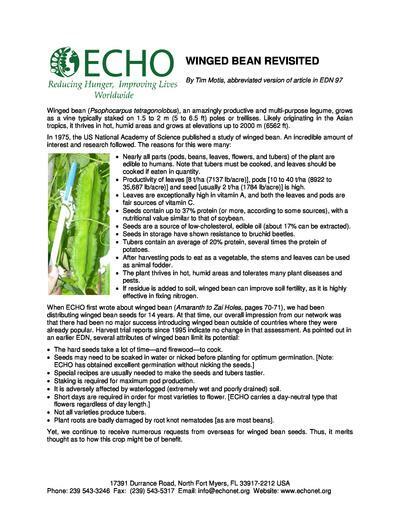 In finding a niche for winged bean, determine which part(s) and attributes of these plant parts will be of greatest benefit to farmers. Varieties differ in how much of a particular plant part they produce. Among seven varieties evaluated in a trial at ECHO, ‘Ribbon’ and ‘Bogor’ were the highest pod and seed producers (Table 4). Varieties also differ with respect to pod color, size and shape. The large, crimson-red pods of ‘Chimbu’ may give it extra market appeal. Pods of ‘Flat’ and ‘Square’ are shaped as their names imply; with these varieties, shipping-related damage to the pod wings would probably be minimal. As I studied more about Moringa seed, I learned that its valuable edible oil and this led me to start researching ways of extracting the oil. There are commercial chemical extractions, but these are too costly for the tribal people we work with. There are also cold and warm commercial presses, but these also are too costly for the people we work with. I read about boiled water extraction, and practiced some, with some success, but frankly it’s a lot of seed for only a little oil, and too easy to mess it all up and end up with nothing or little oil at best, not to mention the fuel expense in boiling the lot. We at ECHO are sometimes asked what we recommend for a germination medium in situations where seeds or seedlings need to be started in pots or plastic sacks before going out to the field. This past summer, we conducted a trial at ECHO to make and evaluate potting mixes that could serve as effective substitutes for purchased potting mediums, since ready-made potting mixes are typically unavailable, impractical or expensive in many developing countries. Nurseries usually resort to developing some ratio of topsoil, sand, and organic material (e.g. animal manure and/or compost) to serve as a potting medium. For our trial, we sought to use ingredients that would be accessible in many areas of the developing world. Based on some common potting mix recipes, we developed a series of recipes using the following components: sand, cow manure, compost, and both charred and un-charred rice hulls. The trial was conducted in the ECHO greenhouse, where seedlings could be monitored and watered regularly. Using maize (Zea mays) as an indicator crop, our goal was to identify one or more potting mediums that would prove suitable for a healthy, uniform population of seedlings for use as transplants. 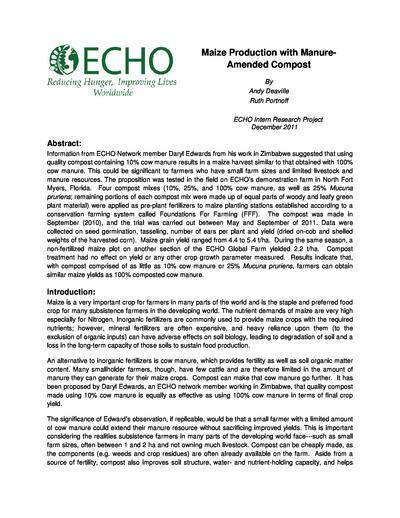 Information from ECHO Network member Daryl Edwards from his work in Zimbabwe suggested that using quality compost containing 10% cow manure results in a maize harvest similar to that obtained with 100% cow manure. This could be significant to farmers who have small farm sizes and limited livestock and manure resources. The proposition was tested in the field on ECHO’s demonstration farm in North Fort Myers, Florida. Four compost mixes (10%, 25%, and 100% cow manure, as well as 25% Mucuna pruriens; remaining portions of each compost mix were made up of equal parts of woody and leafy green plant material) were applied as pre-plant fertilizers to maize planting stations established according to a conservation farming system called Foundations For Farming (FFF). The compost was made in September (2010), and the trial was carried out between May and September of 2011. Data were collected on seed germination, tasseling, number of ears per plant and yield (dried on-cob and shelled weights of the harvested corn). Maize grain yield ranged from 4.4 to 5.4 t/ha. During the same season, a non-fertilized maize plot on another section of the ECHO Global Farm yielded 2.2 t/ha. Compost treatment had no effect on yield or any other crop growth parameter measured. Results indicate that, with compost comprised of as little as 10% cow manure or 25% Mucuna pruriens, farmers can obtain similar maize yields as 100% composted cow manure.